It’s no secret that Hamas and the Palestinian Authority routinely funnel aid money to jihad terror activities, and there is no reason why this deal will be any different. Loosening restrictions along the border will also spell trouble. The more appeasement of jihadists, the more emboldened they become. Although Palestinians have focused enormous energy upon raging about the Israeli border with Gaza, Egypt, too, has a border wall; construction of it was approved in 2010 and the wall was finished in 2013. After a terrorist attack in the Sinai Peninsula in 2014, the “Rafah crossing has been virtually sealed.” Barricades by Israel and Egypt have both been erected for security purposes only. 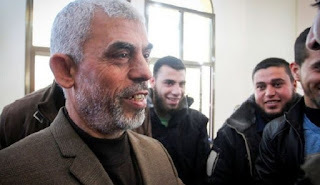 Yahya Sinwar, the leader of Hamas in the Gaza, on Saturday praised the violent riots along the Gaza-Israel border. “Our [Palestinian] people today stuck to the basic principles, the right of return and the breaking of the siege, and they support the resistance,” said Sinwar, who came to encourage those who participated in the disturbances on the occasion of Land Day. According to Sinwar, the issue of the terrorist prisoners in Israel is at the top of the list of priorities in Hamas’ talks with Egypt and Qatar, which are serving as mediators in negotiations with Israel. He stressed that the so-called “March of the Return” processions would continue until the siege is broken, the “right of return” is realized and liberation arrives. The riots took place a day after reports emerged of an agreement between Hamas and Israel on a calm in Gaza….